Melbourne is an absolute paradise if you enjoy exploring second-hand shops and discovering treasures like unique items of clothing, interesting jewellery, knickknacks or home wares. The city is a vintage shopping wonderland! Here’s my guide to the best places to go vintage shopping in Melbourne. There are lots of individual vintage shops in Melbourne but there are also a few bazaars, where several shop owners team together to provide lots of vintage wares in one place. Lost and Found Market offers several different vintage stores (I didn’t count precisely but there is probably around 30). The indoor market has a large hall that mostly contains clothing and the main area features stalls that focus more on home wares and knickknacks, although there is also clothing in that area. Among the many treasures on offer at Lost and Found there is jewellery, clothing, accessories, footwear, menswear, crockery, glassware, tins, furniture, home décor, toys, games, photos, postcards, clocks, and vinyl. A fitting room is available by the counter. There were some interesting pieces of furniture at Lost and Found, so it’d make a good place to go if you are looking for a feature piece of furniture like a chaise long, lamp or coffee table with a bit of character. Located in the funky southern suburbs, Chapel Street Bazaar offers an unimaginable variety of treasures. In addition to the usual clothing and home wares, Chapel Street Bazaar has a selection of specialty stalls including stalls offering old tins, linens, badges, French items, and old cameras. One of the more ‘interesting’ items was a koala tea cosy made from kangaroo fur and there was also lots of ‘Nipper’ memorabilia (the HMV dog). If there is a particular item you are looking for you may find the best variety at Chapel Street Bazaar, which at a guess, contains around 40 individual stalls. The Chapel Street Bazaar fitting room is at the back corner of the market, nearest the stalls selling clothing. I’ll include a word of warning that claustraphobics might be better off elsewhere. There is a lot of stuff crammed into Chapel Street Bazaar. Parts of some stalls are impossible to access because there is so much stiff in them. It could be difficult to avoid disaster if you take a bulky handbag or small children! 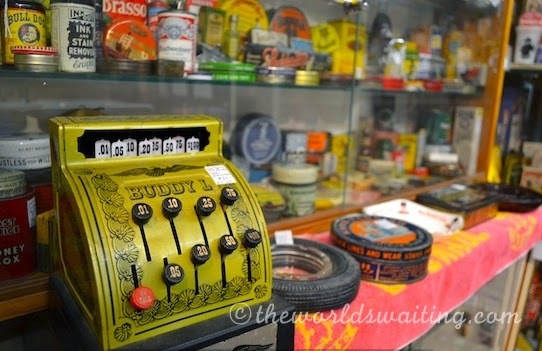 The bazaars are a great place to start when vintage shopping in Melbourne, as there are so many stalls in one place. However there are also lots of individual shops around the city. Charity shop Hunter Gatherer caters to those seeking vintage goodies at inexpensive prices. The stores stock items that have been hand-picked from the hundreds of donations made to the Brotherhood of St Lawrence foundation each year. There are several stores around Melbourne but the one on Brunswick Street seems to have an especially eclectic range if you’re after some clothes with a more bohemian flavour. They sell a wide variety of clothing, accessories, jewellery, knickknacks and home wares. Salvation Army stores are also found across Australia. This small store in the city centre focuses on clothing, footwear and menswear. It also offers a few accessories. What makes this store stand out though is that all the products are organised and displayed really neatly, making it a lovely store to visit. Melko offers new clothing, and some jewellery, that is designed in a retro style. So while it is not strictly speaking vintage shopping, it gets a mention because the merchandise sold may appeal to those seeking vintage bargains. Clothing follows 60s-inspired designs and makes use of bright colours and bold patterns. There are so many vintage shops in Melbourne that I really feel I have only scratched the surface. Northcote is home to several vintage shops and there are a few others dotted around the city and North Melbourne that I also want to check out. Which are your favourite vintage shops in Melbourne? Share your tips in the comments below.